Audacious architecture in the heart of the Cité Internationale designed by Renzo Piano, state-of-the-art facilities and a pleasant setting enable it to compete with the biggest international destinations. 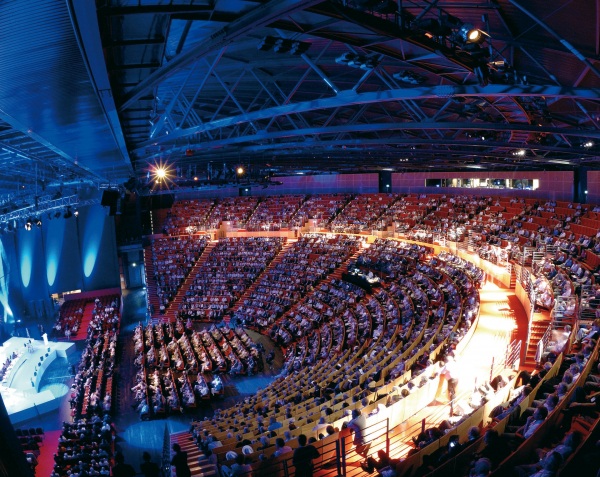 The Lyon Convention Centre has a Lecture Hall which is unequalled in Europe, complete with its auditorium opening out 180° onto its stage area and its entrances inspired by Gallo-Roman amphitheatres. Two (900- and 300-seat) lecture halls. 3 underground car parks with a total of 3,350 spaces. 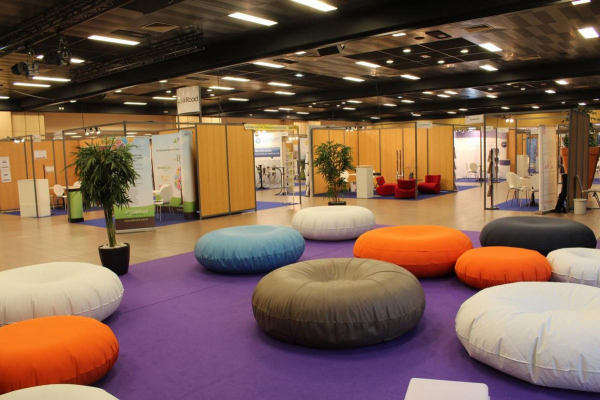 The number 1 French exhibition centre after Paris, EUREXPO-LYON was built in 1984 on a 110-hectare site and today features 140,000m² of exhibition space. Its main activity is hosting both trade and public shows. The main ones include: Pollutec, Piscine, SIRHA… But it also hosts all types of events: conventions, conferences, gala receptions, etc. Eurexpo was also recently given a makeover including a new Reception Hall and the new Paul Bocuse area. Other extension projects are ongoing. Hall Paul Bocuse: a 10,000m² modular space including a 2,400-seat lecture hall, which can be extended to 4,200 seated or 6,000 seated/standing. 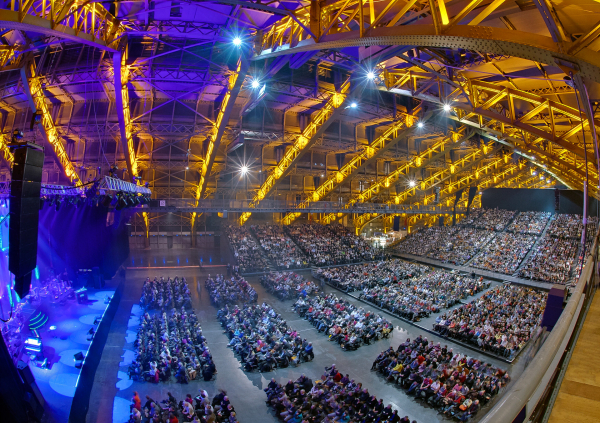 It can also host major Conventions, Conferences, Gala Dinners and Shows, offering exceptional conditions. A remarkably-renovated historical monument made from stone, metal and glass, Halle Tony Garnier hosts European-scale events in a unique setting. This totally modular and versatile site offers multiple technical options in an avant-garde setting that has successfully retained its original identity. 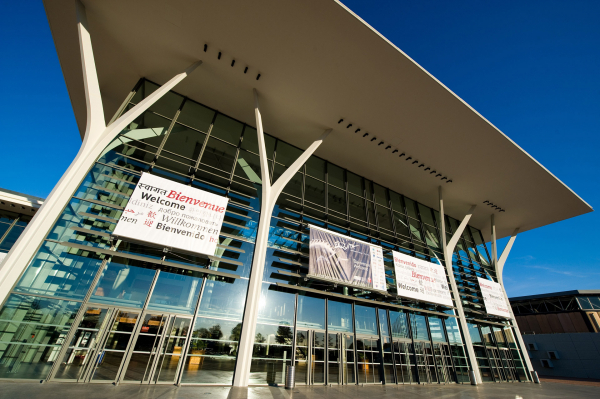 This 17,000m² uninterrupted and single-storey space offers optimal conditions for hosting prestigious events: concerts, shows, trade shows, conventions, exhibitions, etc. Tiered seating: 3,000 to 17,000 in setaed-standing version, 4,416 fixed and modular seats, with possible extension to 5,496 seats. Halle Tony Garnier's reputation has spread well beyond the Auvergne-Rhône-Alpes region. Espace Tête d’Or is ideally located right in the heart of Lyon, just a short walk from the park of the same name and the Part Dieu mainline railway station. It has 2,400 m² of functional and modular space. With large plenary rooms on the ground floor and various meeting rooms on the upper floors, Espace Tête d’Or offers facilities ranging in their capacity from 10 to 2,500 people. A versatile and user-friendly space for all types of events (conventions, exhibitions, general meetings, meetings, cocktail parties, etc.) from 10 to 2500 people. Its main 2,400m² space, which is both modular and functional, offers a range of configurations on the same level: plenary hall, sub-committee rooms, exhibition space, catering, etc. Easy access: 5 minutes from Part-Dieu railway station, direct link to the motorway network and Lyon Saint-Exupéry airport.